I wrote in the About page that I would show work in various stages of progress, successful or not; and as I have almost finished the second dream embroidery for my “Make it Through the Night” project, I thought I would show this at the “will it never ……. end”? stage. This embroidery has been a real struggle to make, which is so strange as I have had the drawing of my dream for over 10 years, have often looked at it and thought “one day”. 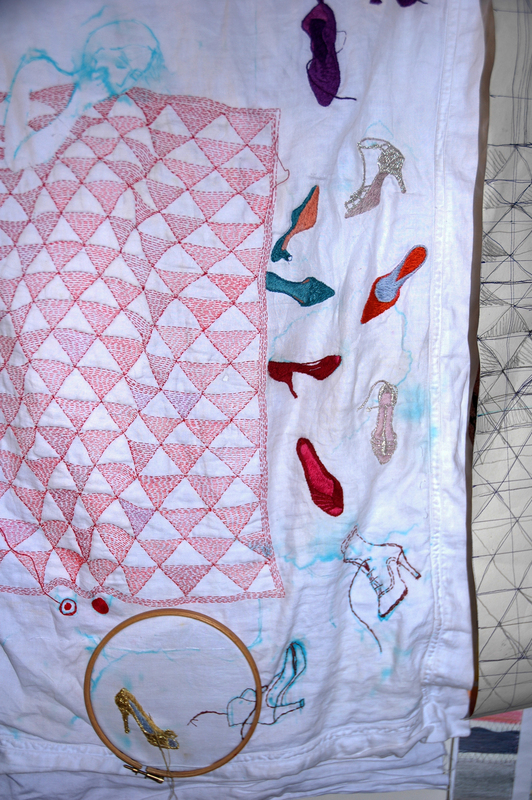 For several well considered reasons I decided to embroider it onto a bed sheet, therefor everything was life size – “a sheet of dreams” I started it in August and mention it in the blog “Samplers” and It took about one month of drawing, making patterns and sampling various techniques before I could start to make the work; then another month’s actual making before I gave it up – I thought that if I shelved it I may eventually get the courage to continue the mammoth task of stitching it. I had made many samples and even got as far a printing an entire quilt onto the bed sheet, this took weeks so I was loathe to abandon it. 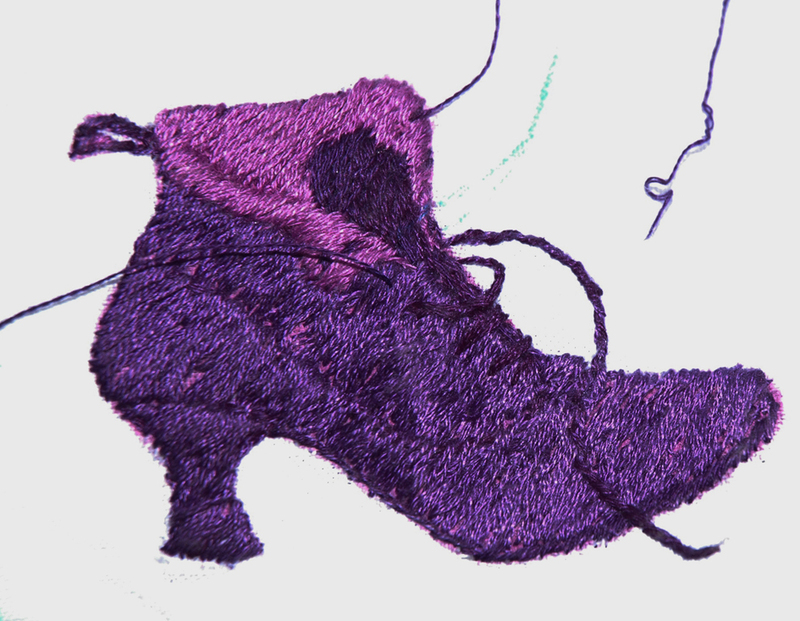 But basically the sheer scale was just too daunting – I knew I had to hand stitch each shoe and there were about 10 0f them, and they were shoe sized and in a single thread, and I was losing the will to live at the thought of it. I didn’t blog about it at the time as I was unsure of why I was experiencing such difficulties and I certainly didn’t have the heart to write about it. life size sample for sheet of dreams. Meanwhile I made other works – some commissioned pieces which can’t be blogged until they are published….and so generally let the problem lie at a low level, to be absorbed knowing that eventually it would re-emerge…this is how work often resolves itself; you just have to be patient and let it suggest its own way forward…..then I made some handkerchieves for the same project, and realising how good it was to work small and quickly again – I thought I could maybe make the work smaller and embroider a” pillow of dreams” – after all, I reasoned, this is where you lay your head and where all the action stems from. So I set to work again restitching the whole image onto a vintage linen Oxford pillowcase. 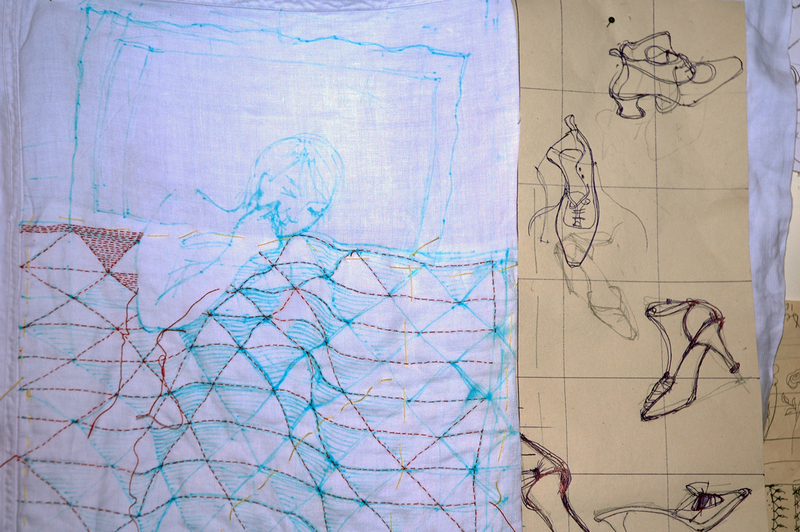 The drawings remained exactly the same but now I used running stitches to make the quilt then padded it like a trapunto technique to emphasises the body shape that emerges from the distorted “patchwork”. This was all so really interesting to work, I was now on the right track and gone were the misgivings of “copping out” for a smaller scale. 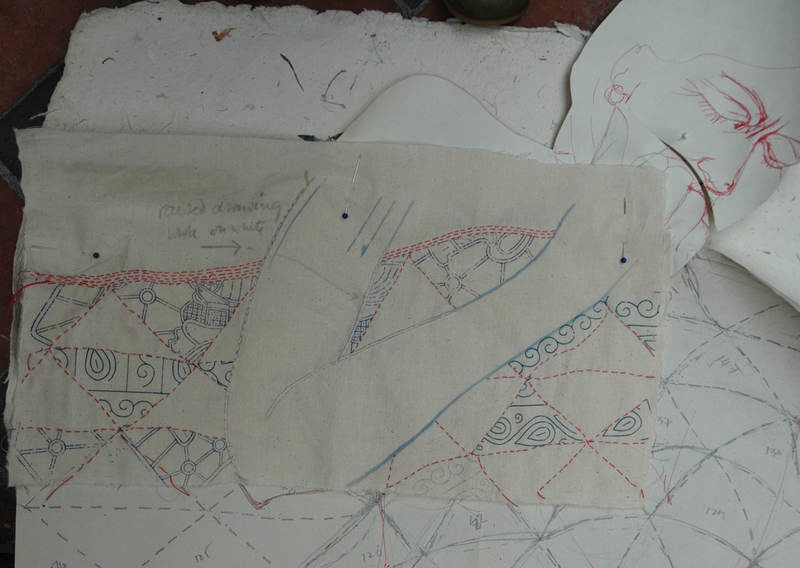 drawing of the my own shoes and embroidered pillow in progress. 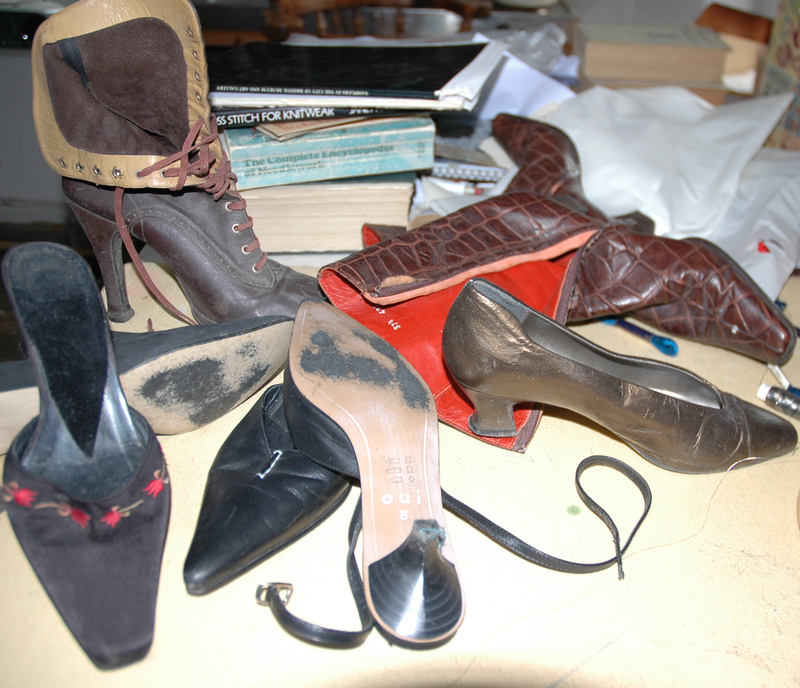 Some shoes I cannot bear to throw away and have used them for years for drawing classes – if you can draw shoes you can draw most things put in front of you. 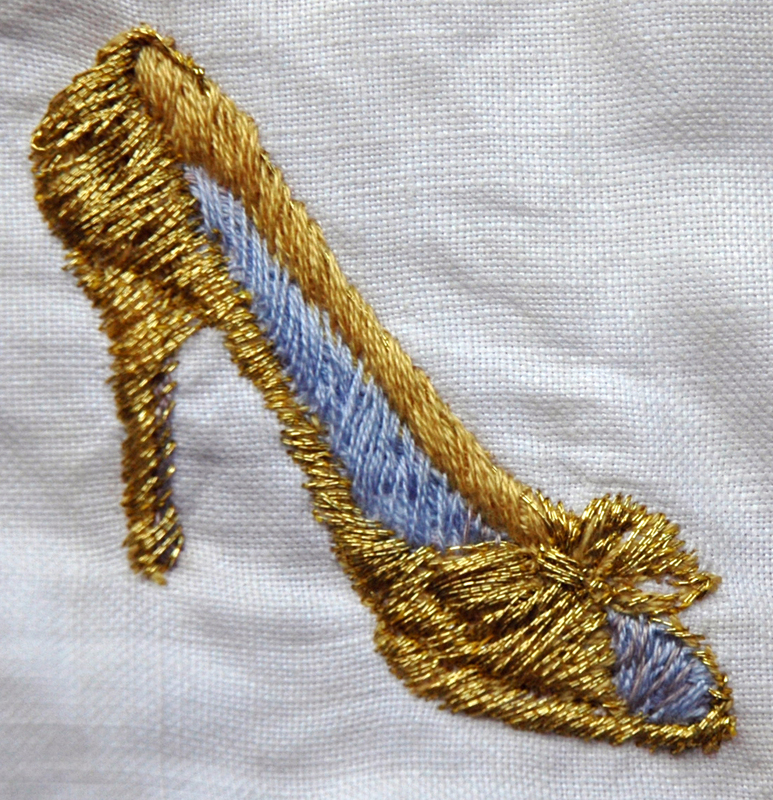 Eventually I got to embroidering the shoes, they are quite small about 10cms / 2 inches long and are stitched in one strand of silk, cotton or metal threads, I love glitzy shoes. Ironically I constantly bang on about how stitching is like meditation and I am presently running a project called “Stitching and Thinking” with a group of makers where we are considering the state of mind reached when the world goes away and its just you and your thoughts and the work; sometimes called a state of Flow, or old hippies used to say ” In the Zone” – wherever it is it is wonderful. 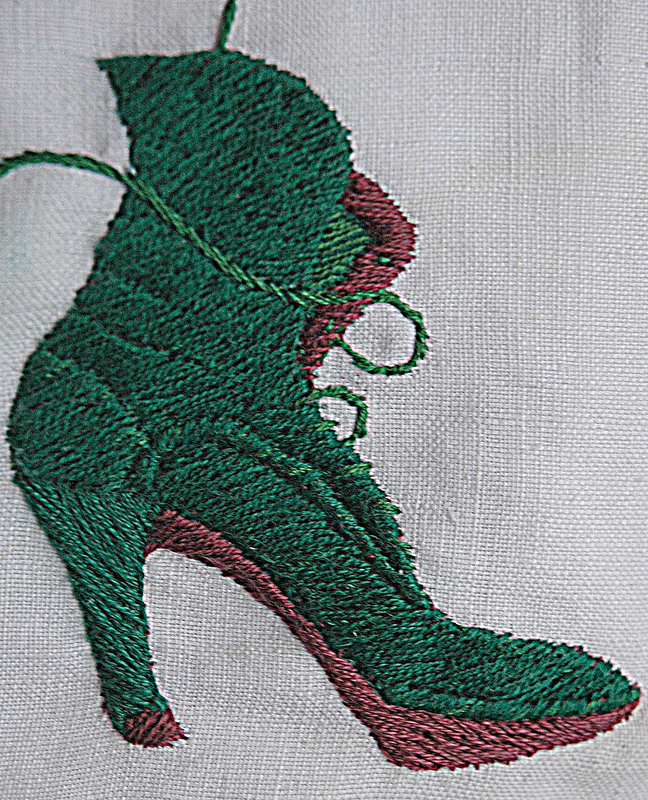 I haven’t been there for a few weeks while battling with these embroidered shoes…and I blame an “acquaintance” of mine, Nigel Hurlstone, who is a tutor on a course where they still embroider – Manchester Met (MMU). He gave me a much needed and requested mentoring session on the whole ‘Make it Through the Night’ set of work whose progress he has been following – we have a reciprical arrangement where he crits my stitched work and I crit his new written story – telling work. But he inadvertently said something that absolutely made me loose faith in how I have made this piece of work – “what is really fascinating and worth you considering is that these shoes LOOK as if they have been stitched on the multi – head machine – but they haven’t ” – and he was right! 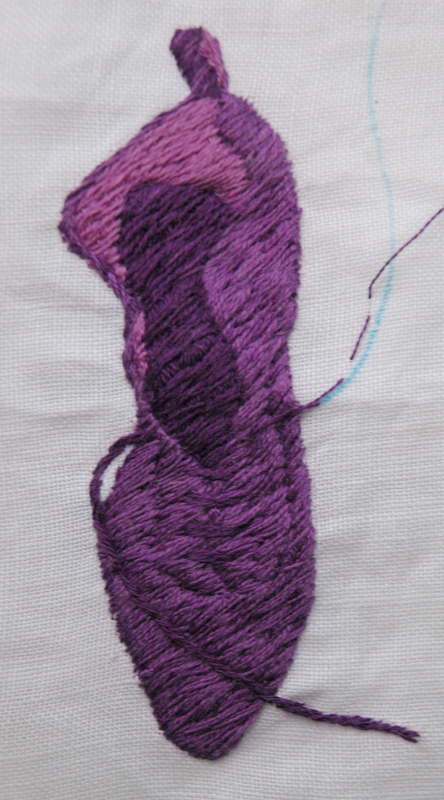 The long and short stitches are so neat and precise they look machine made – I have been overtaken by technology. So I now have to rethink for what and how I stitch by hand….. how will this machine – made perception affect the way people appreciate my work? One of the ideas underpinning my current practice is the notion of time taken: to hand stitch something which is very slow and therefor valued means that the subject or concept is worth consideration……but meanwhile I have to finish this piece of work – but am I wasting precious time when I could just give it to some one to machine it for me – I am not about to learn how to use a multi -head. But it does make me wonder how I can change my whole way of working in cloth when anyone can “draw” with stitch. Janet, don’t even start to think like this. Your art is not about the time you spend creating. This way you may come to conclusion that it would be faster to just take a picture of the sleeping person and shoes lying around. There’s something in the process and you know it. Of course some pieces are tiring and some are easy breezy, this is part of the game. Dear Bozena, you are so kind to reply so often and so positively. Yes, I know that I am at the stage where I just want it finished, but never the less this remark did worry me and I have been asked many times about my work -” it is by machine”? But it is not a compliment in this instance when you have lovingly stitched something with such faithfulness to how you FEEL about the subject and someone thinks it is mechanical, which in English has derogatory connotations. And yes you are right that the obvious conclusion to my thinking is a photograph – as if the image is everything – when for textiles it is only half the story. There is a whole movement here in craft based work called SLOW which deals with these issues and more – so I need to think carefully about how I am working for my future outcomes. BUT the underlying issue for me at present is that I can neither exhibit or sell my work easily, it is just too expensive because of my way of working and this is becoming a real problem in these straightened times. I do somehow need to adjust my working strategies – so keep watching, things may be changing. Glad to see that the work on ‘make it through the night’ is progressing! The debate regarding the ‘hand’ or ‘machine’ stitched element to the work is one that will always circle practice such as yours. Sometimes, the handstitch is extremely overt in both its quality and aesthetic. There is sometimes no other way to produce a certain surface, line or mark other than through the process of hand stitch (you will of course be absolutely aware of this) and it is great to see that this work celebrates the fact. But this is work that does not hold the idea or communicate it only on the premise that it is handstitched. 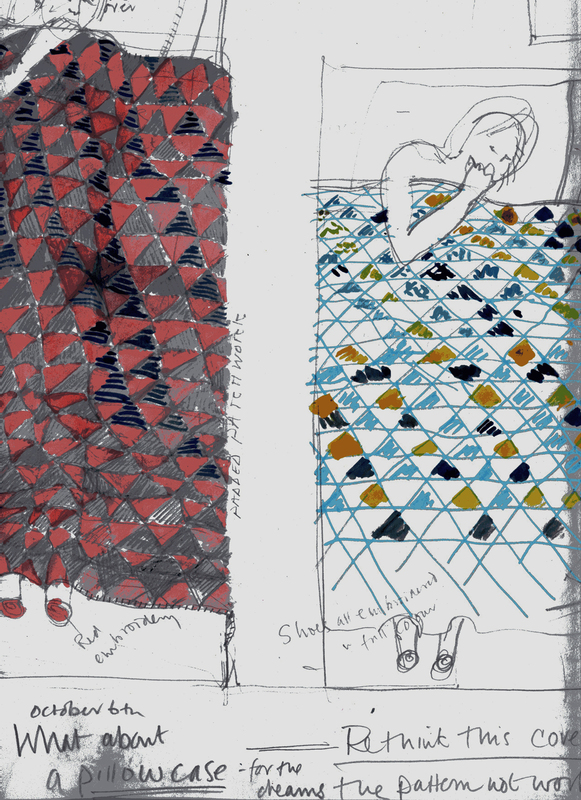 The work relies on the quality of drawing, the thrust of the idea and the craft of making to affirm itself; the fact that it is ‘hand stitched’ is almost incidental to these other qualities; the idea, the drawing, the content EMPLOYS the handstitch into a certain type of activity that is wonderful. Many people can stitch but it is how those skills are literally ‘put to work’ that are important here. This is the real work in this body of embroidery too, and is equally ‘slow’ . 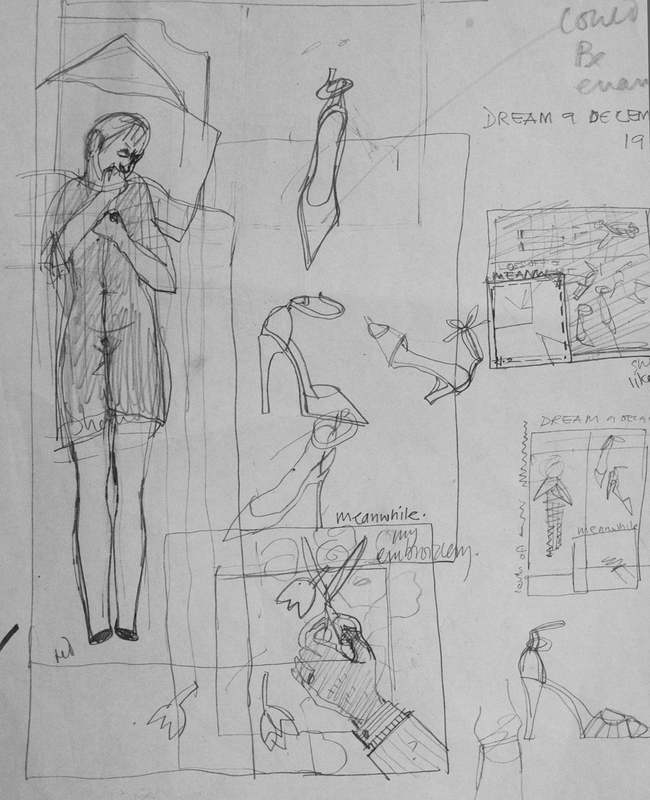 Ideas reveal themselves over time, form slowly, change and then are honed. ‘Slow’ refers to all the research and development as much as the execution of the final work. What the activity of handstitch does is literally slow up the process even further so that ideas and thoughts, images and colour are always in flux. The hand never commits itself in the same way as a machine stitch since it has the capacity to change in the process of making. This is the real difference between the multi-head and the way you have handstiched these images. The machine mark will never change, adapt in process. It is committed. The hand never is; it has the capacity to change in the activity of stitching itself out. So…in terms of process, the handstitch is important to you. It enables this change. From knowing your work so far, it is extremely rare that you will begin work and then simply stitch it out with no change, development, moving about, re-thinking. The process of the hand is essential to your process of making and thus the aesthetic of whether it is machine stitched or not becomes rather a red-herring. It is hand worked because your creative process demands the pace and flexibility of that way of working. So….embrace the quality of it. Hope this makes some sense!